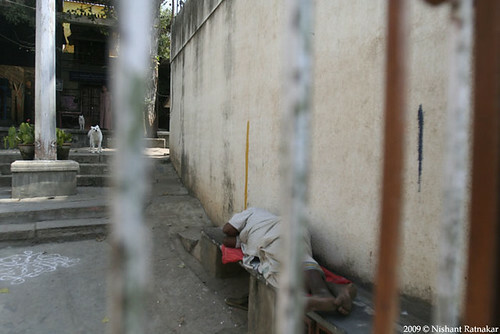 A man sleeps between two colored lines marked by authorities inside a temple complex at Bhavaninagar, for acquisition of property for building of Kadirenahalli underpass. Bangalore, the silicon city of India is witnessing many infrastructural works like new airport, metro railway system, flyovers, underpass and road widening, with the idea to sustain the growth and development of the city. But for all these projects it has to acquire private lands of citizens. This has resulted in stand-off between the state and citizens and the pattern seems to be replicating across the country with creation of special economic zones (SEZ). 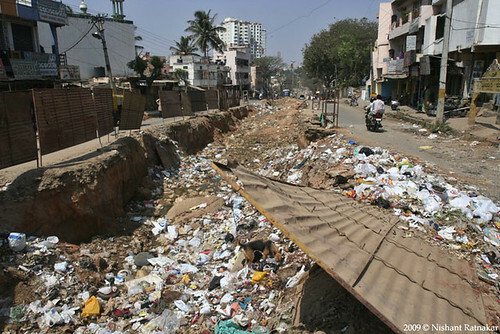 Seen here are photographs showing th result of acquisition of portion of houses and temples at Bhavaninagar, Bangalore to widen roads and build an underpass. 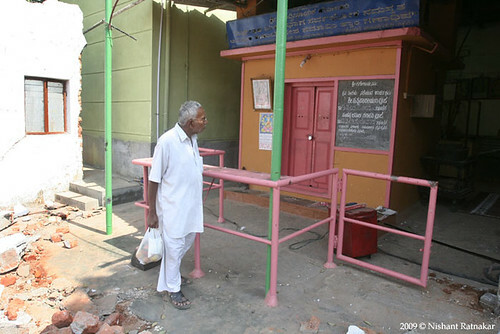 The work came to a temporary halt with residents protesting while a temple portion was brought down by the authorities. In these scenarios, authorities usually come to homes and shops without issuing any notice and draw colored lines marking the portion of the house that will be acquired. Sometimes multiple lines get drawn due to unprofessional surveys. Residents who are caught unaware have no say in the amount of compensation, if at all any, given by the state and have limited time to relocate and rehabilitate. Right to property was originally a fundamental right as per Indian constitution. But the 44th amendment to Indian Constitution in the year 1978 relegated it to a mere legal right. This put any dispute arising between state and citizens with respect to the acquisition of private property by state, out of the jurisdiction of any courts. This allowed the state to acquire any land for any purpose without compensation. As a result, in today’s India there is no real right to private property and no protection against government land acquisitions. 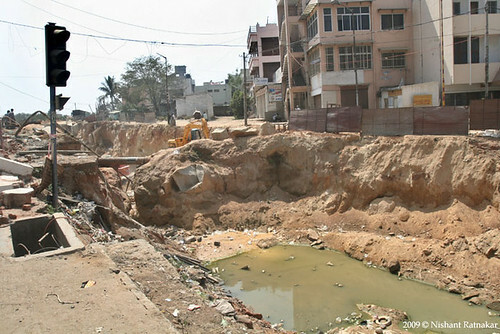 Portion of the ring road near a traffic signal at Bhavaninagar that has now been dug up to create an underpass and requires further widening of road. Portion of a temple that remains at Bhavaninagar after it was demolished by authorities for building of Kadirenahalli underpass. 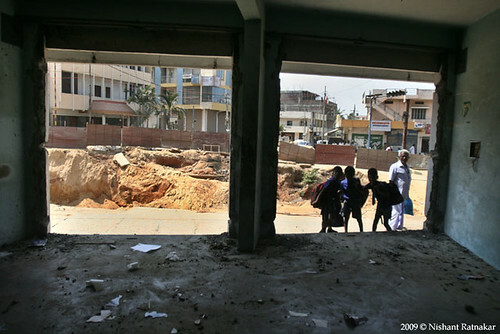 A man walks looking at what is left of a temple that was demolished at Bhavaninagar by authorities for building of Kadirenahalli underpass. 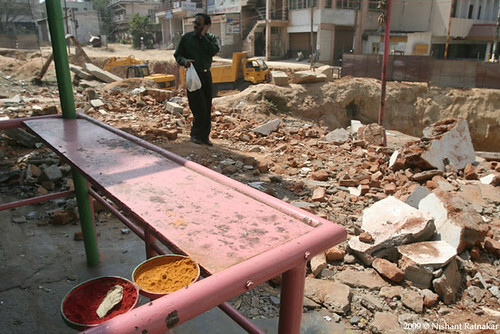 A man stops and looks at what is left of a temple that was demolished at Bhavaninagar by authorities for building of Kadirenahalli underpass. Colored lines marked by authorities inside a store at Bhavaninagar, for acquisition of property for building of Kadirenahalli underpass. 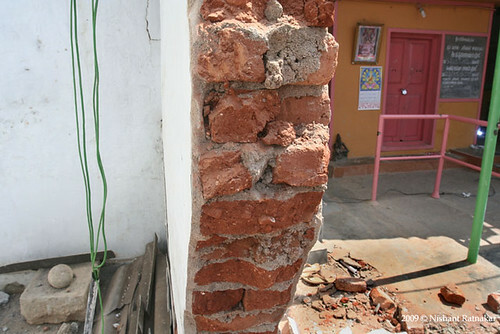 Colored lines marked by authorities on the walls of house that was still under construction at Bhavaninagar, for acquisition of property for building of Kadirenahalli underpass. 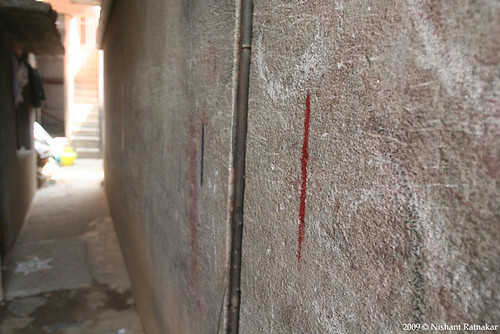 Colored lines marked by authorities on the passage walls leading into a house at Bhavaninagar, for acquisition of property for building of Kadirenahalli underpass. 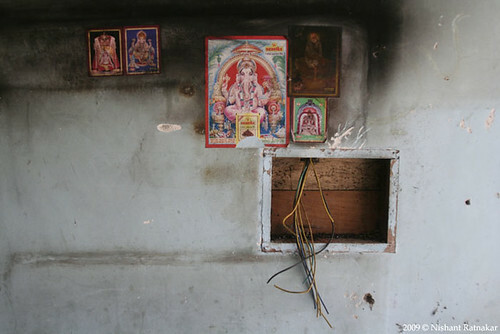 Paintings of Hindu gods left behind by a business house at Bhavaninagar after the premises vacated in a hurry due to portion of the shop getting acquired by state for building of Kadirenahalli underpass. 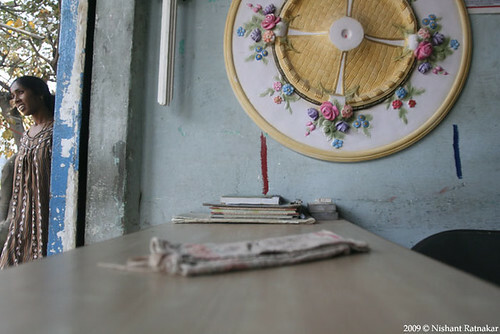 Children look inside an empty store at Bhavaninagar that formerly housed a rice trading business. The store was vacated in a hurry due to portion of the shop getting acquired by the state for building of Kadirenahalli underpass. 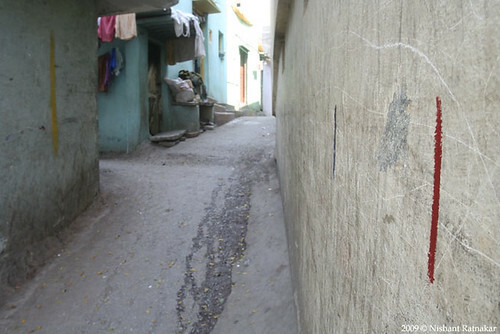 Colored lines marked by authorities on walls of the houses in a street at Bhavaninagar, for acquisition of property for building of Kadirenahalli underpass. 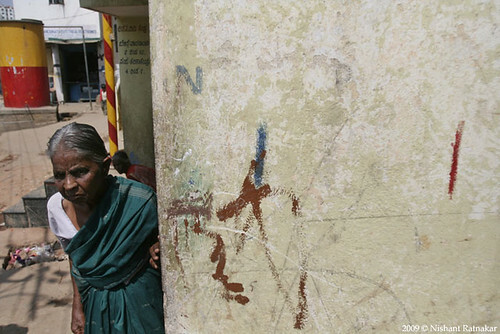 An old lady stands next to the wall of a Anganwadi – a government sponsored child care and mother care centre – at Bhavaninagar, that is dotted with colored lines marked by authorities for acquisition of property for building of Kadirenahalli underpass. 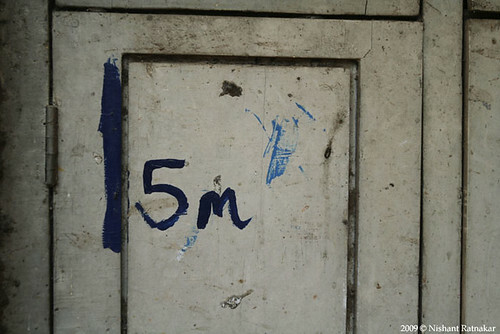 Colored line marked by authorities on the wall of a small store at Bhavaninagar, for acquisition of property for building of Kadirenahalli underpass. 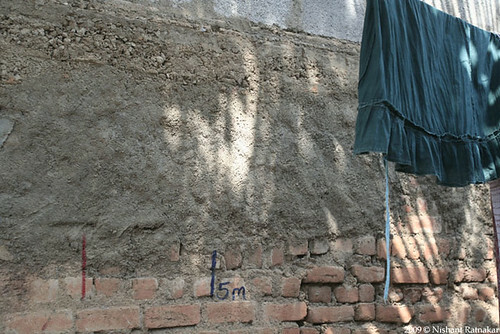 Colored line marked by authorities over window of a house at Bhavaninagar, for acquisition of property for building of Kadirenahalli underpass. A modern Skyscraper apartment in distance contrasting with a garbage filled dug-up ring road at Bhavaninagar speaks about the state of infrastructural projects in the city and rest of the country. Bad project planning and management is coupled with the clashes between citizens and the state over acquisition of property for public purpose. 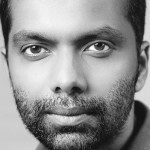 This entry was posted in and tagged documentary, Karnataka, photography, Story. Ok, so now I know why this work is taking so long. Seems like the saga of traveling 2 extra kms is going to continue for a long time. Hope the people affected get their dues and the work gets completed soon. Ok, so now I know why this work is taking so long. Seems like the saga of traveling 2 extra kms is going to continue for a long time.Hope the people affected get their dues and the work gets completed soon.Nice post Nix.